I love to watch and read the materials that come from Abraham Hicks and here I am going to discuss with you some easy law of attraction methods that are given in the book “Ask and it is Given” by written by them. The book actually consists of some 22 games based on the ideas of Abraham Hicks, these games are fun as well as very important for creating a better life. It does not matter if you believe in metaphysics or not, these games can improve your emotional state. Well, this something bizarre for a lot of people because Abraham Hicks is source energy that speaks through the body of Esther Hicks. People have always questioned this but I believe that a wise person will focus on the message rather than the messenger. After reading the materials that came from Abraham and watching many of their sessions I have concluded that without a lot of experience, a simple and common person like Esther would not be able to come up with such deep understanding and intelligence that is shown Abraham Hicks. However, I am not at all concerned in proving the reality of Abraham Hicks, all I know is that it is fun to hear what they got to say. After giving an explanation of everything that creates the reality of our life in about 60 starting pages of the book, they have provided more than twenty games that are essential for improving our lives. What is very special about these games is that they are very simple and yet very powerful. All the games in this book are distributed according to the emotional state that you are currently in, you do not have to read and play each and every game. You can decide the game that will suit you by knowing the vibration that you are currently operating in and this book also guides you to recognize that level. However it is not possible to explain to you everything about these games in few words but three of the starting games are my favorite. The first time I tried this method, I got an immediate result and moreover it amplified the good feeling that I was already having, it filled me with gratitude. This involves thinking about something that is good in our life right now, it attracts more good thoughts, which follows more and more.. This is a fun filled one, I love this game because I get a feeling of “letting go” by leaving my desires for universal power to act upon. In this game we put all our wishes in a box(much similar to vision board), but after dropping them in the box we get a sense of relief from the feeling of craving for it and that is how it will be manifested. In creative workshop the author makes us to focus on four primary areas of our life that are body, home, relationships and job. This game involves taking few minutes from our regular schedule and sitting down to write what we want in all these four areas. This method makes us to feel good because we are thinking about things that we want, and when we give a direction to our thoughts, it starts flowing as if a barrier is lifted. Apart from these three games, there are many other games with proper guidance in that book and you can choose to read it if things in your life is out of your control. 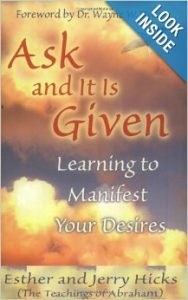 I would strongly recommend the book “Ask and It Is Given” to you if you want to know some more exercises for using your creative power. I hope you enjoyed this post. You may also like to read about some law of attraction affirmations for manifesting more wealth. How do you feel about Abraham Hicks materials? Do share your thoughts with me, I would love to hear from you.